After a certain period of time, you get bored with your tattoo. Laser Tattoo Removal:La’Mer has all the advanced techniques to make you free of that unwanted tattoo. Our clinic is equipped with advanced tattoo removing laser machine which removes the tattoo in just few sessions. Surgical Excision: depending upon the depth and colour gradient of the tattoo. Few deep rigid tattoos require surgical excision. Our experts excise such rigid tattoos and give you mark free flawless skin! WHAT IS THE PROCESS OF TATTOOING? It involves dipping of needles into various inks. Now a days, electrical tattoo device injects ink particles from the epidermis to a constant depth (usually 1mm) below the dermo-epidermal junction. WHAT ARE THE TYPES OF TATTOOS? These are road side tattoos , such as bindi tattoo. These are usually light and easily removed because content used is organic ink. These are made for cosmetic purpose like tattoo of eyebrows & Lips etc . WHAT ARE THE REASONS FOR TATTOO REMOVAL? WHAT IS THE IDEAL METHOD FOR TATTOO REMOVAL? Lasers are the gold standard method for tattoo removal. WHAT SHOULD NOT BE DONE FOR TATTOO REMOVAL? All of these will create unacceptable scarring. 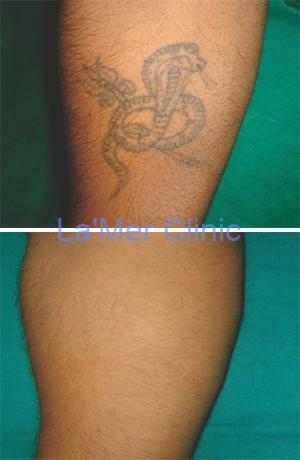 WHICH TREATMENT IS AVAILBLE AT La Mer FOR TATTOO REMOVAL? 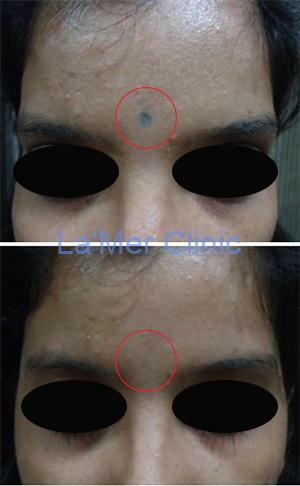 Laser in La Mer are FDA approved & safe to use. WHAT IS APPROXIMATE TIME REQUIRED FOR TATTOO REMOVAL? Duration of treatment depends on the type of Tattoo, it may take 6 months to 1to 2 yrs and may even take upto 3 years in multicoloured tattoos. Few deep rigid tattoos require surgical excision, which may leave a very fine scar.